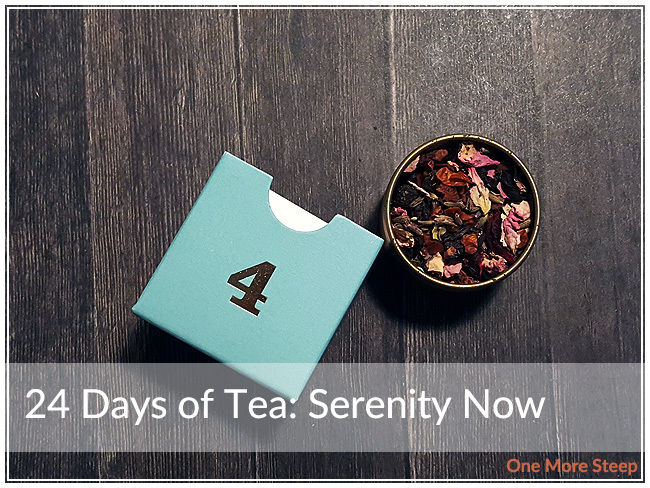 Day 4 of the 24 Days of Tea advent calendar is Organic Serenity Now. It’s a very, very, very floral and fruity smelling tea. This is not something that I would have necessarily picked out for myself, mostly because of the overly sweet combination flowers (in particular lavender) and fruit. I can see the lavender buds, the dried fruit, and other dried flowers. 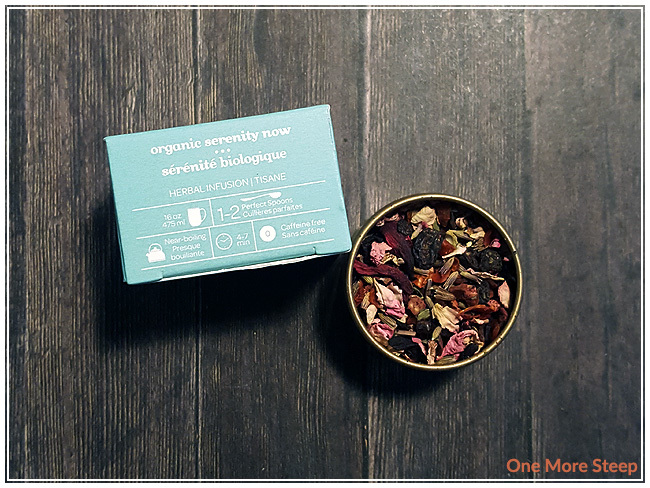 The ingredients in Organic Serenity Now are: currants, rosehips, lavender, spearmint, blueberries, quince, apple, hibiscus, rose petals, strawberries, natural rose water, and strawberry flavouring. The packaging from the 24 Days of Tea recommends steeping Organic Serenity Now in “near-boiling water” for 4 to 7 minutes (this is the same as what is stated on the product page on their website). Near-boiling water is 90-95°C (194-203°F), I used the “French Press” option on my Breville IQ Kettle, and I steeped the Organic Serenity Now for about 6 minutes. Organic Serenity Now steeps to a deep pink. 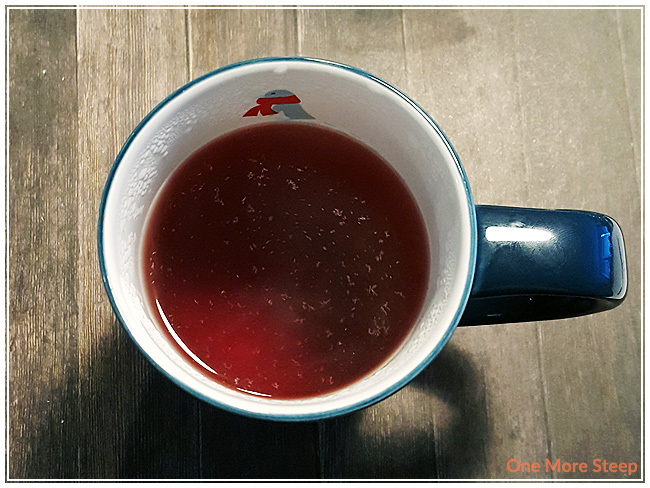 There was quite a bit of debris from the tea at the bottom of my mug even with using a stainless steel tea infuser, so I would recommend using a tea filter instead if you’re not one for having ‘stuff’ in your tea. Organic Serenity Now has a very strong floral smell to it that leans heavily towards lavender. 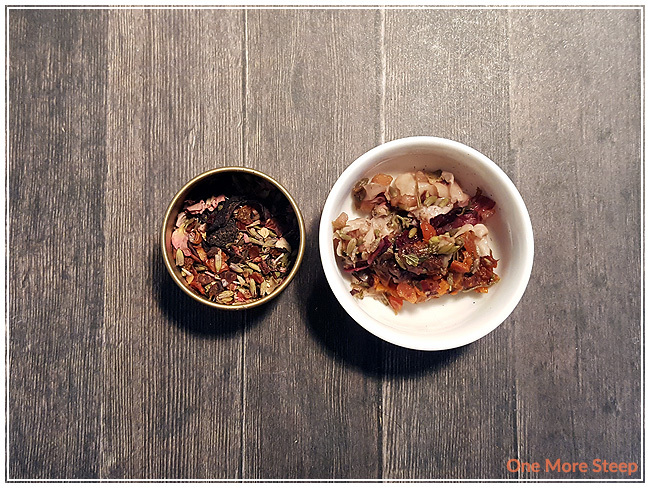 I found that it has a very strong lavender taste to it that overpowers the other ingredients in this mix. I ended up pouring out half of the tea that I had steeped. I generally do not resteep herbal infusions, I did not resteep Organic Serenity Now. I didn’t like DavidsTea’s Organic Serenity Now. There is just something off-putting about a mug full of tea that smells like and tastes like lavender. I generally associate lavender with fancy soaps, not with my teas.